The people forced to pay Normal’s employees – TAXPAYERS – have a right to know how much they are paying. If Normal posts employee compensation anywhere on their website, it is well hidden. Luckily, OpenTheBooks.com has the 2016 salaries. Benefits and the cost of pensions are NOT included. Posted in BloNo, Koos, Local, Normal, Progressives, Taxes.Tagged #openthebooks, employee compensation, openthebooks.com, TOWN OF NORMAL. Wow!!! I’m glad I don’t live in Normal or McLean county. Those salary’s seem outrageous. Are taxpayers getting their monies worth from those folks? I don’t think the salaries are that outrageous but I do believe that in the private business world, several of those people are incompetent as hell and I would have assigned them to the unemployment line a long time ago, starting at the top with the city manager. However adding in the benefits, yeah, many of them ARE overpaid. Over paid and WAY under worked, but WELL fed.. I’d call them pigs, but I like visiting the REAL ones at the fair. At least you KNOW what you’re in for..
No accountability as usual. Too many paper pushers and not enough worker bees. If taxpayers don’t get out and object and vote there is no hope for changing the system. Some are not overpaid – the top dogs ARE overpaid. 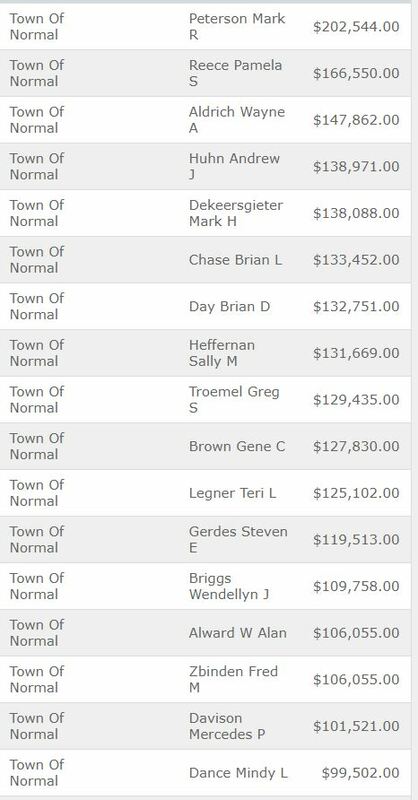 If everyone on this list was laid off overnight, the average taxpaying citizen in Normal wouldn’t notice a difference. Next Post Early Voting starts tomorrow!